Kicking off New York’s Fashion Week 2018, Mastermind Connect partnered with custom tailored menswear line InStitchu. 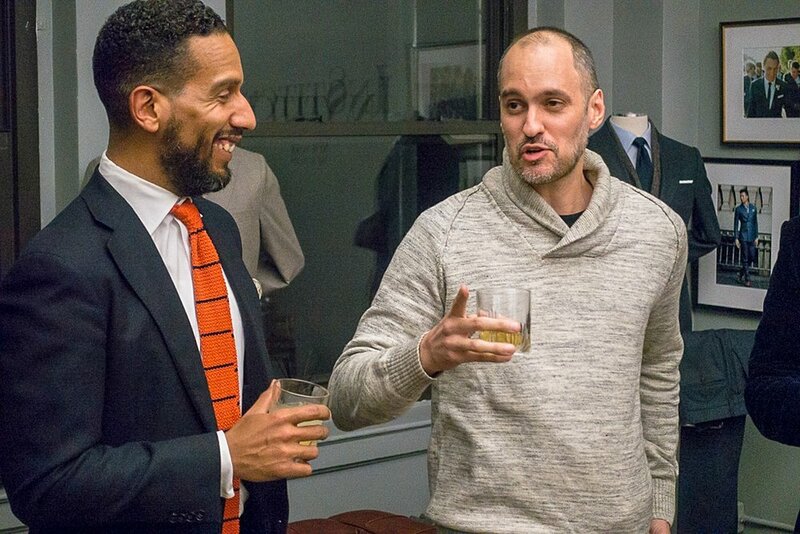 InStitchu is an Australian custom menswear retailer, founded in 2011 by high school friends, Robin McGowan and James Wakefield opening of a showroom in New York, which marks the startup’s first expansion outside of Australia and New Zealand. InStitchu has grown to become a market leader in Australia’s made-to-measure menswear market, having generated an average growth rate of 116% year-on-year since inception. Much of the growth can be attributed to InStitchu’s omni-channel business model, with revenue being split between online sales and a network of showrooms across Australia, New Zealand and now New York. Originally conceived as an online only business, the co-founders realized the need for a physical store presence to service clients that wanted to be able to have an in-person tailoring experience. Physical showrooms in Sydney and Melbourne were introduced shortly after to complement the online offering, providing customers with a physical destination to place orders and inspect new fabrics. We were fortunate to have met their (very dapper) traveling tailor, Andrei Flores-Cortes, who showed great interest in what our men's group was seeking to build. Andrei is a master at his craft, and it was only fitting (no pun intended) that he would help in guiding Mastermind Connect members in making the right decision in selecting the right fabrics from InStitchu's extensive catalogue. Our evening was enhanced by YAVE Tequila based cocktails that were served throughout the night. Joe Cruz Jr. dreamt up Yave Tequila, and it's flavored variations in Harlem, made them in Mexico and delighted us with them in New York City's Flatiron District. He has created ultra-smooth tequilas and authentic partnerships. Yave turns the key to unlock access to an unapologetically fun lifestyle, which celebrates their vision. TasteMakers NYC created delicious hors d'oeuvres which were infused by the very same flavored tequilas they were paired with - Nothing short of "to die for" on the #foodie scale. TasteMakers NYC is a creative culinary group created by schoolmates Ronald Moss and Jonathan Arthur in 2012 in Harlem, NYC. It’s their mission to cultivate the “social culinary arts” by supporting events with inventive food pairings that complement engaging conversation. There is something to be said about a group of men who are able to bond over a variety of topics, experiences, and lifestyle preferences. I love the fact that I can expect to have light conversation about men's fashion, comparing modern and traditional styles, and describe what makes a piece of clothing timeless. Most of the men I've met in this group are very comfortable in their own skin, and are very successful in their business and personal endeavors. But, seeking a more meaningful connection with like-minded individuals was ultimately the reason why they joined Mastermind Connect. As we move toward having deeper and thoughtful conversations, meeting for our monthly Book Club, Cigar and Scotch event, and other communions, we continue to forge partnerships that organically align with our purpose. Conversations range from toxic male ego, our goals and desires, as well as discussions on how to realize better lives as partners, fathers, sons, etc. In the meantime, we will continue to champion those who show an interest in self-growth, and in creating experiences that help to enhance our lifestyle. Our culture won't be defined by one particular thing, activity or "look." This is something we’re very proud of. As I write this, we just finished our second visit to Anderson's Martial Arts for a Muay Thai Kickboxing event that was born from a single question Mike McConnell asked me one day; "Can I kick it?" he said, to which I obviously responded "yes, you can!" But speaking about seconds... I need to contact Joe Cruz Jr. and ask him to sponsor one of our monthly Think & Drink mixers. I would love a second chance to taste that delicious Jalapeño flavored Yave Tequila! Big thanks to our members Juan Yanez and Robert Holley for capturing the moment, and Deron Griffith for recording it. The team at Grave Shift Studios did an amazing job at editing the video below! Click on the video for full recap! To receive invitations to our events, and learn more about how to join our community and become a member, please visit us here!